A graduate from the London’s Brit school of Performing Arts, Harris J shot to fame in 2015, after winning a talent contest. With grandparents from India, Ireland, Poland and Jamaica, his debut album seeks to draw on musical influences as varied as his family heritage. 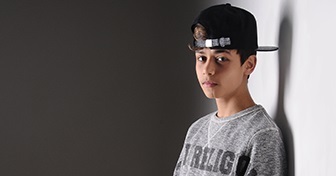 Dubbed the Muslim Justin Bieber, with 100 million YouTube hits, and over half a million followers on Instagram, he’s taken the global Islamic music scene by storm. Here he talks to Things Unseen’s Remona Aly about his music, his faith and how chewing gum is his Achilles heel when it comes to fasting. And he shares his newly released single, Save Me From Myself – and tells us why it’s perfect for Ramadan. Im speechless,Harris Im so proud of you. Thank you so much,I.really love this amazing interview . Harris J always inspire me,I wish all the best to Harris . Salam mashallah i was listening to this and I just wanna say I usually get bored with pod casts and stuff but this. This kept getting interesting I loved it. Thank you Harris and Ramona and everyone who is involved to make this.